This house has a bad mold problem in the basement due the plumbing leak in the kitchen. 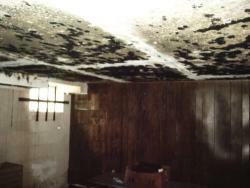 The insurance company need to have the mold tested to check if it was black mold and the test came back positive for black mold. The inspection for mold showed it was all over the basement of this home in Gastonia NC just west of Charlotte. 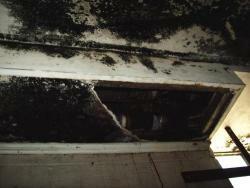 The home needed to have the mold remediated. We came to do the inspections and testing of the mold and Rodney did the remediation of the mold in the house. It was a big mold job. The mold started from this plumbing leak. The home owner did not call a plumber in gastonia to take care of this plumbing leak under the kitchen. This container was put under the leak and all this mold came from the plumbing leak. 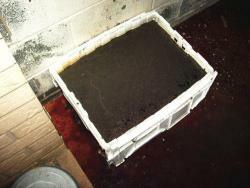 Gastonia plumbing leak leads to black mold. Do not let you leak turn into a mold problem, get it fix asap. Submitted by GeraldGoforth on Mon, 03/14/2011 - 14:08.